Our Birthday Newspaper Books are the perfect birthday gift, revealing newspaper headlines on each and every one of the recipient's birthdays. The books start with a front page newspaper reprint from the date of birth, and then continues with a front page for every birthday thereafter. So if, for example, the birth date was the 12th October 1963, this will be the first front page to appear. After that, it'll be 12th October 1964, then 1965, then 1966 and so on, all the way through to their last birthday. Opposite each front-page reprint is a blank page which you can use to fill with photos and messages that relate to that year. It's worth bearing in mind that the book's thickness will depend on the age of the recipient. The newspaper book is available in three finishes and we give you the opportunity to include a personal message and the option to emboss the recipient's name on the front cover. Each book measures 38 x 30cm. 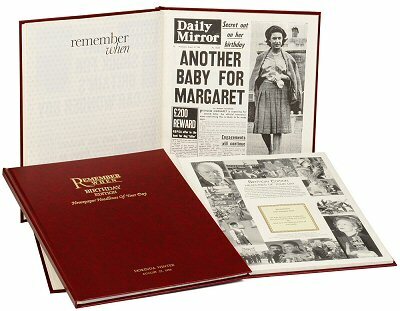 It opens with a front page montage surrounding your own personalised label containing the recipient’s name and greetings. Once you have selected your year above, we offer personalisation options, including a choice of bindings, embossing and a personal message to the recipient inside. Usually sent to UK mainland addresses on a 2-3 day courrier service. We also offer an Express service. Delivery overseas can take a few days longer. When you input your address details, you can also add special delivery instructions.